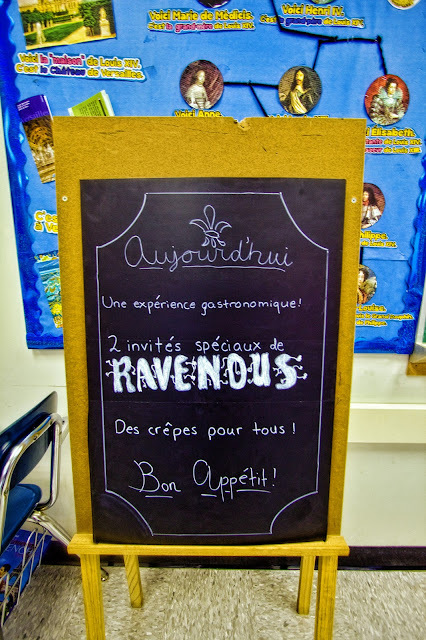 Since I've started teaching, I've had the owners of a local crêperie called Ravenous into my classroom every year to serve crêpes to my students, who order them in French. 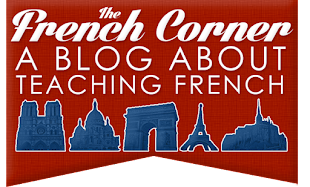 I always loved their restaurant before I started teaching, and I thought it would be a great way to engage students in learning about this popular French treat, which many of them had never tried. This past year, the restaurant changed owners, but the new owners were eager to continue the tradition. Students formerly had a choice of three sweet crêpe toppings (Nutella, lemon curd, or jam), which they could decide on the day of the event. This year, we added two savory crêpe options as well (Ratatouille and Bretagne), so due to the variety of types of crêpes being offered, students were required to make their selections ahead of time. The day before the event, we review key vocabulary terms (Vous désirez, qu'est-ce que tu veux, je voudrais, s'il vous plaît, et pour vous, j'ai faim, voilà). On the day of the event, the room is set up like a restaurant, with desks in groups of 3 or 4 and a tablecloth and a number set on top. After learning a little about the history of crêpes and how they're made, I select one student at each table to be the serveur/serveuse, and they come and get a pre-made sheet with the name of each crêpe on it and a spot for tally marks as well as a spot to put the table numbers. Entirely in French, students take the orders of their classmates (and themselves) and bring the slips, with a tally for each type of crêpe) up to the front. Then the owners prepare the crêpes and a parent volunteer and I bring them to their tables. The nature of this process is such that some students will inevitably be done eating before others even start, but I don't really see this as an issue. I tell students beforehand that this will happen, and to keep in mind that, as we have learned, meal-taking is a very social event in the French culture. Although it may seem odd to them to keep sitting and chatting after they have finished eating, it wouldn't be odd at all in France. To encourage the use of French at their tables, I have a translated copy of the Ravenous menu in French with clip art illustrating what many of the words mean. Students can work together to try to figure out what's in the various crêpes or say which ones they would like to try. For students who have already visited the restaurant, they enjoy learning how to say the name of their favorite creêpe in French. When the class is almost over, I ask the students to give their feedback (always positive) and share what kind of crêpes they'd like to see invented (ice cream, pizza, and bacon are usually mentioned in every class). 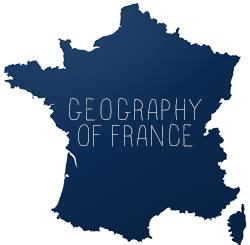 Often, members of the school and local media, as well as administrators at both the building and district level, come in to interact with the students and enjoy a crêpe right alongside them. The students get a kick out of having their principal or superintendent sit right down next to them for a meal! The parents who come in love the opportunity to see their child's classroom, especially since the opportunities for parent to come in become less and less after elementary school. Their presence also allows me more freedom to interact with the students a few at a time and take lots of photos (which are incorporated into my end of the year slideshow). It doesn't surprise me at all that this event is one of the highlights of students' year in my class. They look forward to it with such enthusiasm ("When are we eating the crêpes?? "), and their faces light up when they walk in the room on the day of, when they see and smell the ingredients. Most people, especially kids, love food, and this was a lesson that revolved all around it! The great news for language teachers is that food is so intertwined with a country's culture, that we can easily weave it into our lessons. While the vocabulary used in this lesson is pretty basic, it gives students the confidence that they can use their language for an authentic task, and because they associate it with such a positive event, they remember it much better. It's also just a great community builder! Now that you've seen what I do, I'm curious to hear how you use food to bring culture to life and engage students! How would you modify what I've done to suit your own classroom? This is a brilliant idea and it's making me think about reaching out to a creperie that we have nearby. ,I love that they brought everything and did it so you didn't have to try to bring everything. My big issue with making crêpes is the student's impatience !